Automated vehicles (AVs) are becoming an imminent reality in our cities. 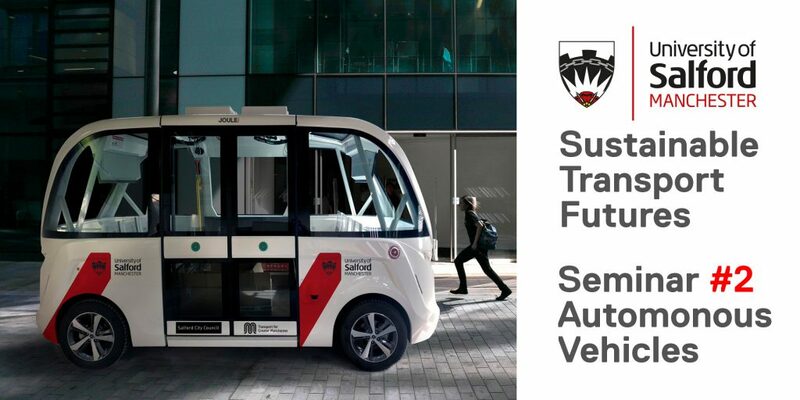 In the past few years, transport planners have increasingly explored the feasibility of integrating connected driverless vehicles into public transport systems. They potentially offer a last-mile solution or an alternative in routes where bus or tram travel is not viable. Yet there have been concerns over safety, road sharing, and whether including AVs inhibit active travel over short distances. Seminar Report – Will automated vehicles help to increase sustainable travel in our cities? Mike Brown, ICZ Lead for Engineering and Environment, and Joe Flanagan, Business Development Manager, gave an introduction to the type 4 Navya AV and an overview of the project at Salford. This included an appraisal of challenges faced so far and in the future: pedestrian crossings, moving from private roads to public roads, health and safety compliance, registering and insuring the vehicle, pre-mapping the routes and the physical infrastructure required to make it work. So far the project has been a massive learning experience. Delegates were then given a chance to go for a ride in the AV around campus. Mesiam Babaie, Lecturer in Automotive & Autonomous Vehicle Technology at Salford talked about the number of physical benefits of AVs, which include: reduction of CO2, particulate matter and harmful gases, a reduction in the use of diesel. Big changes are expected in fuel types in the near future. A key argument surrounds the reduction of potential for human error causing accidents. Deaths on the roads are a globally significant killer. AV and V2V technology will help manage traffic better. For it to work, ownership models may have to change – it may not be necessary to own your car – companies will provide them as a service. Other benefits include reduction in parking spaces which has connotations for land-use. Anna Craciun, Innovation Strategy Officer at Transport for Greater Manchester, shared TfGM’s perspective that AVs will augment other forms of sustainable transport in the region. A third of all trips in GM under 1km are car trips. Work is being undertaken to develop AVs on the A6 in Stockport which TfGM are coordinating. Two potential futures were discussed: ‘Utopian’, which relies on nudging and policy activities being successful in reducing congestion, improving safety and making streets more healthy and ‘Dystopian’ involving more congestion, hacking and inequality. Project Synergy is a key project taking AVs forward. As part of our seminar we used an audience voting tool to spark discussion around certain questions. You can see the results of this session below.